In the early centuries, they wrote cat poems about the Thai cat and put into the book “Tamra Maew”. The history of the Thai cat dates back some 700 years to Southeast Asia. Commonly referred to as the Old Siamese cats they were known as Wichien-Maat in Thailand which means “moon diamond” or “diamonds and gold”. There is some controversy over the true nature of the Thai cat. The controversy surrounding the Thai cat is that they are not a pure breed. Many consider them to be the old Siamese. 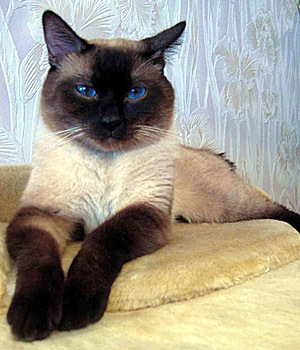 The changes between the Modern Western Siamese and the new Thai cat took place, when the British brought the Thai cat to the UK with the expressed purpose of breeding a more appealing cat strictly for the purpose of showing. This creates more of dilemma to an already difficult situation. In 2007, the Thai cat breed was created and appeared under the, “New Breed,” category. One great thing to emerge from this debate is as of May 1, 2010, The Thai cat has champion ship status. Now the breed can register and take part in competitions with other breeds. All available information suggests the Thai cat is the oldest breed of cat. They are also, sometimes mistaken for the Korat cat and the Modern Western Siamese. Each of the breeds has similar appearance. However, there are some distinct characteristics upon close examination show them to be three distinct types of cats. 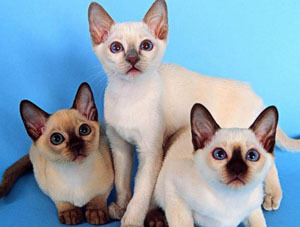 The Thai cat and the Siamese cat are similar, and they have a common ancestry. They share the pointed gene. 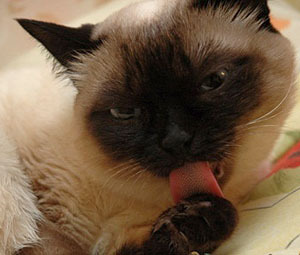 The Thai cat is often referred to as the old Siamese cat. Even, though they may have that common ancestry, the Thai cat is broader in features than the modern Western Siamese cat with longer legs. Thai cats have incredibly beautiful blue eyes. Some of the colors available include seals point, lilac point, blue point, and chocolate point. They are elegant, yet robust. Thai cats have close fur that is fine and strong. Thai cats have heavier, more rounded body, and rounded head that makes it a heavier cat than the other cats. The Thai cat likes to be around people. They love being affectionate and close to their owner, and they are openly friendly with other people. However, they require lots and lots of attention. One of the interesting things about Thai cats are intelligence. They are extremely playful and full of curiosity. Because they have such a calm temperament, they are quite suitable for any environment. 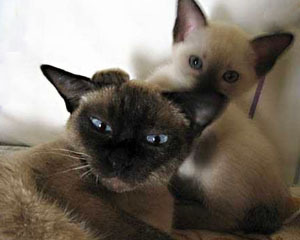 The Thai cat displays patient with children, and they are suitable for older adults. This makes it a Thai cat a good choice for a family pet. Like all cats, they have that air of independence that can make them appear a little willful. Thai cats are very vocal. They have a high voice that can sometimes be mistaken for a child crying. They are ingenious and clever, and they are guaranteed never to be boring. Thai cats are quite sociable. They are affectionate and love to interact with their owner. They will follow their owners everywhere they go. There is no getting around it. They are friendly other animals, especially if they are raised with them. The Thai cat is truly a beautiful breed, and it is wonderful that the breed has received championship status and a true breed name. There are still some, who feel the Thai cat has been robbed of the original breed. However, the result shows that a cat with presence will always have presence, and it can never be taken away. This cat breed demonstrates the true heart of a champion.